Because cats are carnivores, they require a high-protein diet for optimum health. Eggs are an excellent protein source with a high biological value, meaning that the body can absorb more of the protein and make better use of it. In addition, anecdotal evidence suggests that egg yolks can improve a cat’s coat. 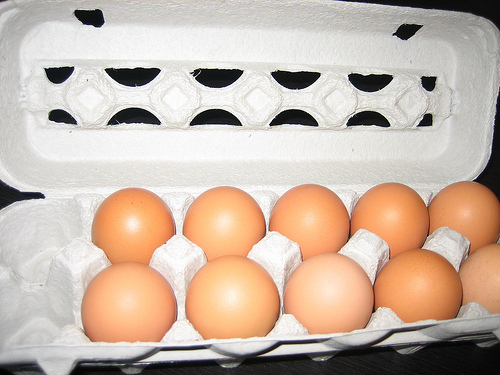 But there are two potential dangers associated with raw eggs: salmonella poisoning and biotin deficiency. Many people mistakenly believe that cats are immune to salmonella poisoning because wild cats eat raw meat and eggs. Although illness due to salmonella poisoning is not common in cats, it does occur. Salmonella bacteria can be destroyed by cooking eggs before feeding them to cats. However, many raw diet advocates believe that the benefits of feeding raw eggs outweigh the slight salmonella poisoning risk. Raw egg whites contain the enzyme avidin, which reduces biotin (vitamin B7) absorption, potentially causing a deficiency. Research suggests that it would probably take relatively high amounts of raw egg white (one or more raw eggs per day) on a regular basis to cause a biotin deficiency. Most experts agree that raw eggs given as treats from time to time are unlikely to cause a deficiency. However, those who want to be on the safe side should either cook the eggs they feed to their cats or feed raw yolks only. Many experts say that raw eggs are alright as a treat now and then, particularly if only the yolks are fed, though some assert that eggs should always be cooked to eliminate the slight salmonella and biotin deficiency risks. Cooked eggs may be fed 2-3 times per week. Choosing organic free-range eggs rather than classic battery-farm eggs is recommended, as free-range eggs are more nutritious. When preparing eggs for cats, do not add any of the seasonings or other ingredients that make them more appealing to humans as some of these ingredients may be harmful. In particular, onions (and other members of the allium family such as garlic) are toxic to cats. Drs. Foster & Smith. (2009). “Foods to Avoid Feeding Your Cat.” PetEducation.com. Hartwell, S. (2008). “Human Foodstuffs Bad for Cats.” MessyBeast.com. McCluggage, D., Chaparral Animal Health Center. (2004). “Feeding Your Cat.” WellVet.com. Pastoor, F.J.H. ; Van Herck, H.; Van Kloosteraz, A.T.; & Beynen, A.C. (1991). “Biotin Deficiency in Cats as Induced by Feeding a Purified Diet Containing Egg White.” Journal of Nutrition, 121: S73-S74. Pitcairn, R.H., & Pitcairn, S.H. (1995). Dr. Pitcairn’s Complete Guide to Natural Health for Dogs and Cats. New York, NY: St. Martin’s Press. The Governing Council of the Cat Fancy. (2010). “Feeding Your Kitten.” GCCFCats.org.